We see new developments in the field of computer and telecommunication technology every single year. Devices become obsolete, systems become outdated and have to be changed, sometimes more devices are added and sometimes we need to make changes in the setup of the whole organization due to logistical issue. Businesses are always on the lookout for new solutions which can address their requirements and need for effective, low- maintenance, scalable solutions for their systems. The traditional method of point-to-point cabling is no more acceptable with today’s requirement for fast-paced technology and conservation of labor, materials and energy. They create a huge load of wiring, compromising with the life and safety of the systems and cause a lot of issues during the installation of new devices, or removal of old ones, even. Making a move is also extremely impractical and causes lot of down time and requires lot of labor and material. Added to this, the mess created by the wires/ cables reduces the flow of air around the switches and causes heating up which results in increased scope of damage and higher cost in the need to cool the area. Structured cabling, on the other hand is a much more refined, modular system of wiring which allows you to overcome most of the above limitations without draining your resources. 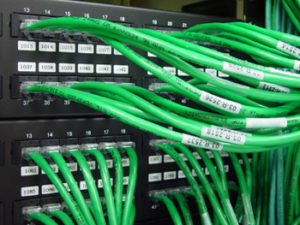 It is overall a much more modular and logical alternative to traditional point- to- point cabling systems. -Simpler to manage: Your cable structure becomes much more easier to maintain and any changes like installations, additions and moving becomes easier, quicker and cheaper. -Higher return on investment: Structured cabling plays the role of a unifier of video, data and voice processes. This reduces the need for periodic updates and reduces the maintenance costs. Even in the eventuality that this is needed, the process becomes much simpler and cheaper. -IT infrastructure becomes prepared for expansion: Structured cabling comes with much greater band- width, which means that future applications like multimedia, video conferencing etc. will be compatible with this system. On an average, it remains relevant for at least 10 years to help adjust to your growing telecommunication needs. -Increased flexibility: Multiple wiring systems are a huge problem to manage. Structured wiring enables you to be much more flexible since it gets consolidated in to a single entity which can transfer data in multiple formats, and can be dismantled and moved to a different location. The above reasons are quite sufficient to realize that a market leader is required to cater to your structured cabling needs. Who better than us, at VRS Tech, the leaders of the industry in Dubai with our superior technicians and cheap prices to manage your cabling needs! Contact us today to feel the difference.